SARA EISEN: Mondelez is having a good day today out with a strong quarter. Revenue and earnings in line. Organic revenue growth of 2.5%. We’ll also see pricing increases in 2019. Joining us in an exclusive interview to talk about all of this from very chilly Deerfield, Illinois, interim CEO Dirk Van de Put. Dirk, welcome. Nice to have you here. DIRK VAN DE PUT: Thank you, Sara. And it is very chilly here. SARA EISEN: Thank you for braving the weather and coming out and talking to us. Trying to figure out what all of these corporate results say about the global economy. You guys have a great global footprint. So, 2.5% organic revenue growth. Does it tell us that everything is fine, or is it more of a Mondelez-specific story? DIRK VAN DE PUT: Well, I think if you think about what we are doing as a company, we’re a snacking company, and snacking is a category worldwide that is growing quite nicely, different from global food I would say, and -- and so we -- we have some momentum in our category itself, and then as we talk about how the consumer is feeling in different countries around the world, we’re a basic type of requirement and, in fact, when consumers are feeling a little bit less good, what’s better than a bar of chocolate or a nice biscuit to sort of help you through the day? So we don’t tend in general to be affected that much by slowdowns. And I would say also we have a very good portfolio of products that can cover any needs that the consumer might have. SARA EISEN: Wanted to dig in specifically on the Chinese consumer. I saw on the call you said sixth consecutive quarter of growth in China, all categories were up. Talk a little bit about what you’re seeing on the ground, given the trade tensions with the U.S. and the slowdown in the Chinese economy. DIRK VAN DE PUT: Yeah, we don’t -- again, we look at our categories, we look at snacking. And the snacking categories in China are growing well. We are growing our market share in chocolate and biscuits. Our online, because online e-commerce is quite big in China, is growing over 70% in 2018 for us. So we don’t necessarily experience in our categories that slowdown of the Chinese economy. And, again, I think that has to see with the fact that we have a basic commodity as it relates to what the consumer wants to eat on a day-to-day basis. So we don’t tend to be affected that much by it. SARA EISEN: What about this issue of pricing? In the U.S. are we going to be paying more for snacks like Oreos and Triscuits? And exactly how much pricing power do you think that you have? DIRK VAN DE PUT: Well, yes. We’re going to be paying a little bit more, I would call it, because what is happening this year is that the commodities, the input costs that we have, packaging, dairy, they are going up more than in previous years, and we have to reflect that in our pricing. Now, it’s not out of this world. It’s not a huge chunk, but we will pay a little bit more. I do think that we have strong brands. Our main brand is Oreo, as an example, is growing 7%. In 2018 in the U.S., we see a lot more repeat buying from the consumer in Oreo, so Oreo as a brand -- as an example, we several others like Ritz and Chips Ahoy that are doing quite well. And so we believe that there’s a momentum, there’s a consumer interest, there’s a connection to our brands that they will accept a small price increase in our product. SARA EISEN: You know, I know that you don’t characterize yourself necessarily as a food company because snacking does better than food, but even among some of the snacking peers it looks like you’re outperforming in terms of sales, I’m thinking Kellogg and Hershey results today. Are you taking share and if so how? What’s the competitive environment like? DIRK VAN DE PUT: Well, I assume you’re talking about the U.S., and, yes, in the U.S. we are taking shares, largely in the biscuits category. We have what we call a DSD system which allows us to go directly to the stores, so we’re in contact every day with many, many stores across the U.S., and that gives us a competitive advantage and that allows us to -- to execute better in those stores. As I said, I think our brands are having some momentum. Oreo is one of the best beloved brands by millennials so I think that’s another competitive advantage that we have. And then we offer quite a range of different products so that we offer the consumer quite a bit of choice. And I think it’s all those elements that allow us to do quite well in the U.S. environment at the moment. CARL QUINTANILLA: Hey Dirk, you know, there’s a school of thought that applies mostly to package good companies. But the idea goes, input costs are either coming down or not going up as much as they were before, and in the meantime, a lot of these pricing increases at retail have already happened, and that’s going to spell a good story for margins in the here ahead. Does that apply to you? DIRK VAN DE PUT: I see that slightly different to be honest. What I see is that the input cost this year, they go up every year, but compared to 2018, our input costs are clearly going up more than -- than it has been. And as a consequence we’re pricing just to maintain, maybe slightly increase our margin, but it’s not going to be a story where because input costs are lower than expected that we will see a big boom in our margins. That is not what we’re seeing at the moment. SARA EISEN: You have a big business in Europe, Dirk. How do you even prepare for a no-deal Brexit. I mean, there’s not a deal on the table, and I know the market is not expecting that the UK crashes out of the EU. But if it does, what sort of disruption and cost pressures are you going to face? DIRK VAN DE PUT: Well, it -- it is quite important, and the difficulty about it is that you can’t really tell what’s going to happen. It can go from a hard Brexit to a more softer or a postponement of Brexit. What one thing is for sure: whatever happens, the flow of products in and out of the UK will be affected. So we have to prepare for that, which means we need to rent more trucks, we need to rent more warehouses, we need to build up inventories of raw materials and packaging materials. So all of that together has extra cost, and we are already prepared for that. But if we would go to a hard Brexit as an example, that could be accompanied by a devaluation of the British pound that could be accompanied by tariffs being put, and like any other company I would assume we ship products in the UK and we ship on the mainland or we ship products out of UK which have to be sold on the mainland. So if it would be a hard Brexit, that has a number of collateral effects. We’re preparing for those, but that would be quite substantial. On the longer term I think, I’m talking about short-term and mid-term effects, I think on the longer-term that will stabilize and consumption will come back to the normal level. So longer-term I don’t think we’ll see major effects. Short-term very dependent on what type of Brexit we are going to see. The effects could be wide-ranging, and -- and after yesterday’s vote I -- I have high hopes that we will go to a softer Brexit and an agreement and that it will all not be as bad as it potentially could be. CARL QUINTANILLA: Finally, I hope you won’t mind one fun question, Dirk. We talked about Oreos earlier. DIRK VAN DE PUT: I don’t mind at all. CARL QUINTANILLA: I saw a study a few months ago that Oreo double stuff is not necessarily double the volume of cream filling of a regular Oreo. Is that true? DIRK VAN DE PUT: Well, I -- I can’t really answer that question. I don’t know exactly how much double stuff is in there. But we’re at the moment launching a new promotion which is Oreo, The Most Stuff Ever which is Double the Double, and I can tell you that is the most stuff you’ve ever seen in an Oreo. SARA EISEN: Personally I prefer the dark chocolate stuff. 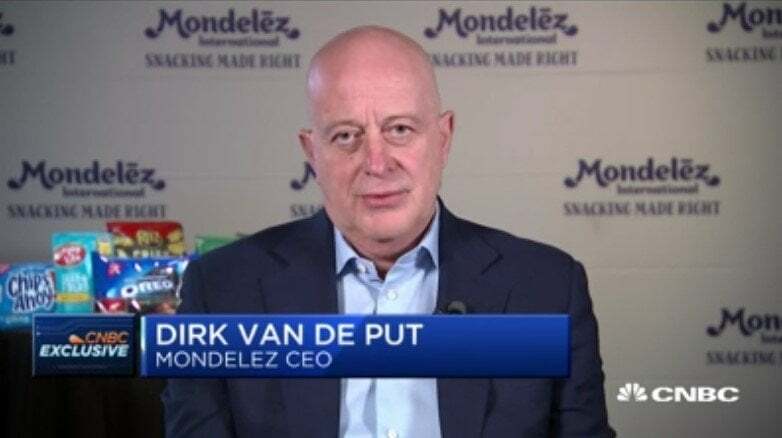 But finally, Dirk, 2018 was your first full year as CEO, and you opened up to us at the investor day last year and had all sorts of ideas and strategies that you would put in place, investments that you were going to make and staying local, for instance, when it comes to snacks. 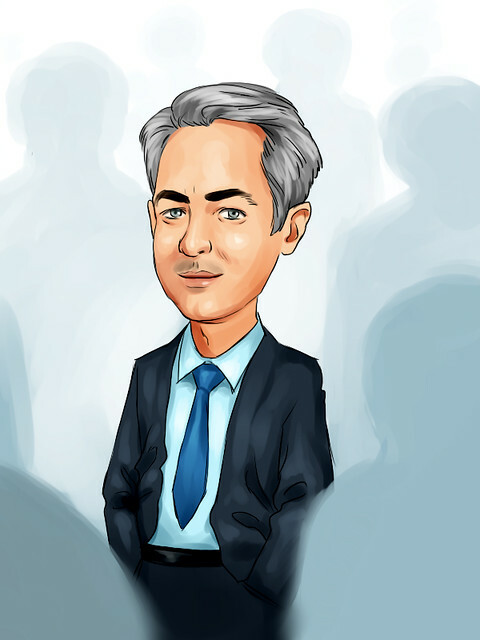 Where are you in the transformation right now of Mondelez? DIRK VAN DE PUT: First of all, we delivered a good year. As a new CEO that was quite important for me: deliver what I promised we would do, and we kind of over delivered, and so I’m pretty happy about that. Secondly, we developed this new strategy which was done by the middle of the year, and we started to implement all the things that you mentioned. And the causing traction-- and we ended the year well in our industry we looked largely at organic growth which was 2.5% which we haven’t seen for a while for our company. What’s more important is we want that growth to come from volume. We want people to eat more, physically, of our product. And that was one of the first years in a long time that we’ve seen that on our products. We are activating a number of things, new ways of innovating. We are playing more with all the different brands that we have around the world. We’ve increased our investment in R&D, so all of that is happening. We’re executing the strategy as we planned. And so far the second half of ’18 is showing the results of that, and we’re entering ’19 quite happy, quite excited. It seems like this thing is going to work, and so we have high hopes that ’19 will be an excellent year for us. SARA EISEN: Dirk, thank you for joining us to talk about all of that. And stay warm. DIRK VAN DE PUT: Thanks for having me and stay warm. Yes. SARA EISEN: From Deerfield, Illinois, Mondelez headquarters, with the stock up almost 4%.